Please, send me more information about ref DM4478 in Guadalmina Alta, San Pedro de Alcantara or similar properties. Located in Guadalmina Alta, a quiet residential area. 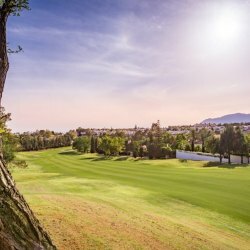 Approximately 350 meters from the Guadalmina Golf Club and 750 meters from the commercial area, this house has been recently refurbished and the technical and material installations are of very high quality. The house is very comfortable as it has three bedrooms ensuite on the ground floor and the upper floor is occupied by the main bedroom with its bathroom and a terrace/solarium. Guest toilet and a kitchen open to the dining room complete this level. A pleasant terrace with seating and dining area with a nice pool will delight those who like to enjoy outside life. The property has double glazing, motorized aluminium security blinds, marble floors flooring and wood in the master bedroom, video intercom, wifi, air conditioning by a heat pump and hydraulic underfloor heating, except in the bathrooms which are electric, electric towel rails and anti-fog heater for mirrors. Fully fitted kitchen, home automation system, solar panels and alarm system pre-installation.